Today I wanted to share a post written by Leo Babauta of ZenHabits.net called My Pursuit of the Art of Living. This is one of my favorite things I read this past year and it resonates with me on so many levels. I too believe that life itself is an art form and also try to practice (also imperfectly) many of the things he lists below. Thanks Leo for continuing to be an inspiration to me. Beautiful post, and for me, very timely. thank you! Very beautiful, very wise words. May be hard to do some of them, but well worth the effort. Here it is already Christmas Eve and even though I've done so much, there are still things that need to get done. I have been struggling with not falling into the "It's all too hard". This morning when I read this post, Leo quote has become a mantra for the day. "The art of living is the art of getting back up". Thanks. Now I'm not freaking out about all that needs to get done. I'm moving on. Every time I starts to moan I just get back up and do one more thing. Thanks. I can feel a calmer Christmas on its way. I really needed to read this right now- Beautiful. Merry Christmas, Ali. Thank you for sharing this. It is something to take in and make our own, as best we can. Have a joyous Christmas! Beautiful! Thank you for sharing. Merry Christmas to you and your family Ali! I just wanted to thank you for your blog. It has been a source of self-evaluation, inspiration and warmth. I pray for you when things look dark and revel when the tide has turned. 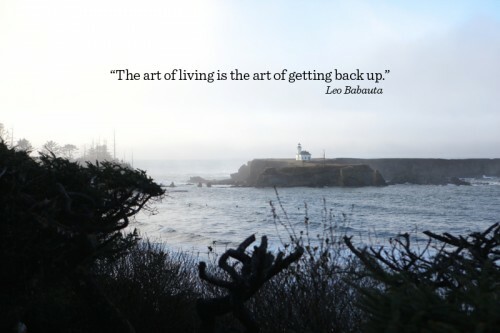 The art of living is truly just getting back up. May you and your beloved family have a very Merry Christmas. Thank you as always Ali...These are just the words I was looking for for my struggling, talented 18 year old daughter...frustrated with taking that step forward out if her comfort zone...Merry Christmas to you and your beautiful family. Peace and love for your year ahead. Great reflection piece. Making time to dwell on each one. Love the photo with the quote. Is that an Oregon lighthouse? We used to live close to Coquille River Lighthouse, a favorite spot. Thank you for sharing Ali! I will include this into my december daily for this year! WOW - After reading this I've found my word for 2014. Thank you for sharing. Leo's posts are always incredible. I find myself sharing them often with friends and family.